Additionally, download Nimlok’s Ultimate Trade Show Planning Checklist to stay organized during the planning process. Properly planning for a trade show is an intensive process, and can seem overwhelming to the first time exhibitor. 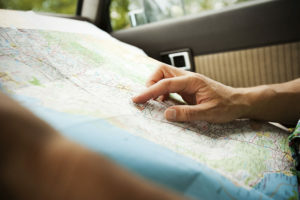 Stay ahead of the curve with these pro planning tips! Related: Be sure to read our trade show planning guide for more tips on getting the most out of your first event. Reserve your exhibit space early to take advantage of early-bird pricing, which will give you wiggle room for surprise expenses down the line. Early registration also leaves more time for planning and booth design. The most important thing any exhibitor can do is to be aware of deadlines. Set deadline reminders to ensure that you don’t miss any opportunities for early-bird discounts on space, services, events, sponsorships and more. We know that your inbox can sometimes seem bottomless, but it is crucial to keep up with emails in the weeks leading up to your event. Coordinators can send instructions in the months leading up to an event, so it is very important to stay up to speed to avoid missing anything critical. Many shows provide attendee lists to exhibitors (usually for a cost) prior to the event. Look at this list carefully to determine which attendees are most likely to be interested in your business. You can also reach out to these attendees via email or social media to promote your booth at the event. However, use caution to avoid spam-like messaging tactics, making sure to keep them personal and engaging in order to gauge genuine interest. Prominently use you booth number on all pre-show promotional materials, as it is the easiest way for interested attendees to locate you on the day of the event. Integrated pre-show marketing programs that feature the booth number will help drive qualified foot traffic to your booth. Discussion panels, seminars, workshops and product unveilings are your best friend. They create excellent opportunities to network with other similar companies and attendees. These connections can then support your business. Consult your show schedule to find networking events, or consider sponsoring your own event. Make sure that you have helpful staff members on the floor, and that they have breaks and back-ups to avoid fatigue. Be clear about goals and expectations so your staff understands what it is your company is looking to accomplish by attending the show. Teamwork is vitally important for a successful event! Giveaways generate excitement among attendees and strengthen brand recognition. 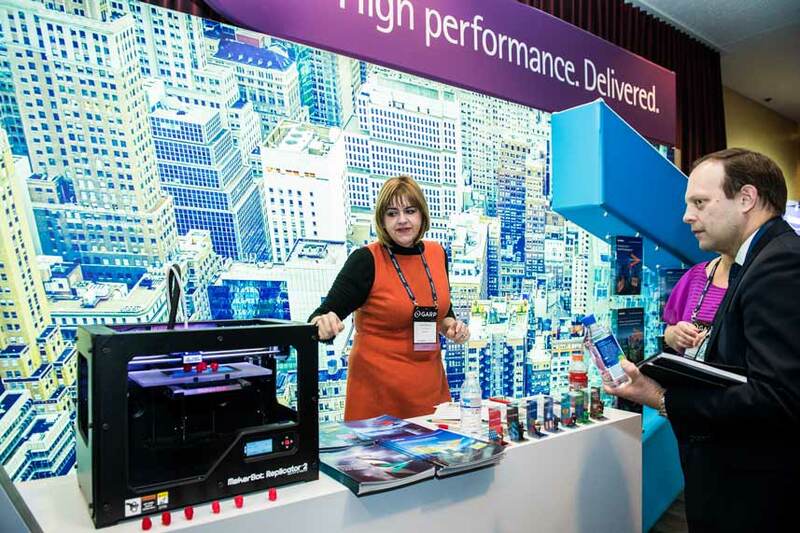 Well-designed swag reminds attendees of your product or service long after the event is over, so incorporating promotions during your exhibit is key. A well-designed trade show exhibit sets the stage for success. This holds true for veteran exhibitors and first-timers alike. 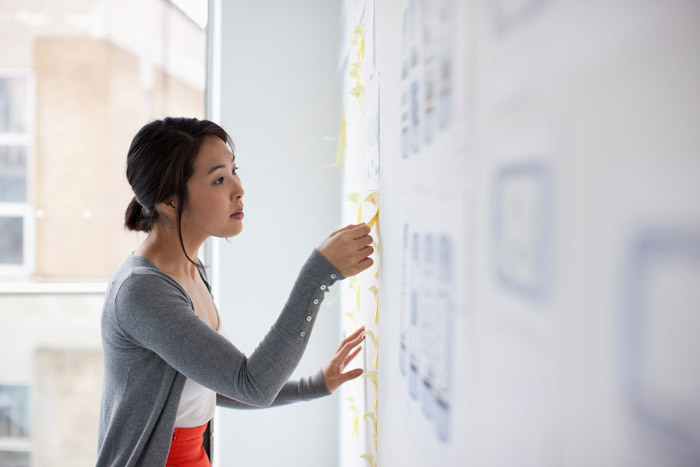 Follow our guidelines for a head start as you dive into the design process! Unfortunately, this definitely does not apply to designing a trade show booth, whether you’re an expert or a newbie. Defining your goal and designing around that goal is the most important step in designing your booth. Whether your focus is on increasing leads, sales or brand exposure will help determine the design, look and feel of your booth, so be sure to define your goals early. To learn more about setting goals, download our Smart Marketers Guide. When planning your first trade show exhibit, avoid the temptation to contract a large space. Instead, start small so as to evaluate the show’s revenue potential. Determine the smallest exhibit size you need to help achieve your goals when attending any event for the first time. It is always best to start small and expand later versus over-spending. Every trade show booth begins as an empty canvas. When designing your first trade show exhibit, understand the exhibit space before making decisions about materials, artwork, graphic designs and booth structures. Exactly how big is the space? Where will your space be located in the building? Is the location a low-or-high traffic area? Will you have access to lighting or electricity? What companies or businesses will be your neighbors? Does the venue have height or structural restrictions that will affect your exhibit? When it comes to your first trade show, there are no stupid questions and finding the answers to these particular questions will save you time and from unwanted surprises down the line. A rental trade show booth might be a good option for first-time exhibitors looking to “test the trade show waters.” If you are planning to exhibit at one or two trade shows, does it make sense to invest in owning an exhibit? Click here to take our “Is Rental Right for You?” quiz to see if exhibit rental is a good option for your needs. Whether your exhibit space is large or small, ensuring that your exhibit is welcoming is a critical part of booth design. The key to creating a welcoming exhibit is including elements that entice attendees to enter your booth. For example, a counter or table at the front of your booth could visually block attendees from entering the exhibit space from the aisle, even when talking to booth staff. Seating, charging station, refreshments and recreation space encourage weary attendees to take a break in your booth. Consider partnering with a professional exhibit designer and maximize your time, while utilizing their experience to give you the look you have in mind. Designing an exhibit can be hard, as you must consider structure, graphic design, colors, textures and more. Whether you’re partnering with an exhibit professional or not, check out our Exhibit Design Crash Course for comprehensive guidance on what to consider when designing a trade show booth. If you have expensive products, giveaways or laptops in your booth, be sure to have secure spaces to store these items after hours. During show hours, place expensive items well inside your booth space where they cannot easily be stolen. Consider adding trade show counters and kiosks that come with lockable storage spaces, allowing you to accomplish two goals with one display element and efficiently using a smaller space. Remember, it’s always better to err on the safe side, rather than regretting it later. Heavy and over-sized displays can be expensive to ship to-and-from the trade show site. Plus, large displays require expo workers to deliver your display from the warehouse to your booth space (drayage) and help with installation and dismantle (I&D). If drayage and I&D are not in your budget, consider portable or collapsible trade show displays. They are lightweight and affordable to transport. Take time to prepare mentally and physically for your event. Stay hydrated and get plenty of rest to be on top of your game. Don’t overextend yourself during post-show events. Go to bed early, eat a balanced diet, and avoid late parties and receptions to keep on your game during multiple-day show. Business casual attire is generally ideal for trade show exhibitors. It provides a professional appearance while ensuring that you remain cool and comfortable throughout the event. You will be on your feet all day, so be sure to wear comfortable shoes! It’s also a good idea to dress in layers as temperatures may vary. Take the time to visit other booths and gain valuable insight into your competitors, trends in your industry, vendors and more. Plus, understanding how other companies present themselves and their products may serve as inspiration for future exhibits. You can also use this opportunity to meet people in your industry. Tech tools offer flexible ways to jot down notes or capture lead information while on the move. By staying organized throughout the event, you can follow up with visitors after the event quickly and easily. Smartphone apps, such as Evernote or CardMunch, are great ways to stay organized and engaged. Phew, that was a lot of information, but we promise that, if you follow these tips, your first trade show will run smoothly. At Nimlok we are committed to providing you with the necessary tools to guarantee that your experience will be a great one. If you need any additional help please contact us today! 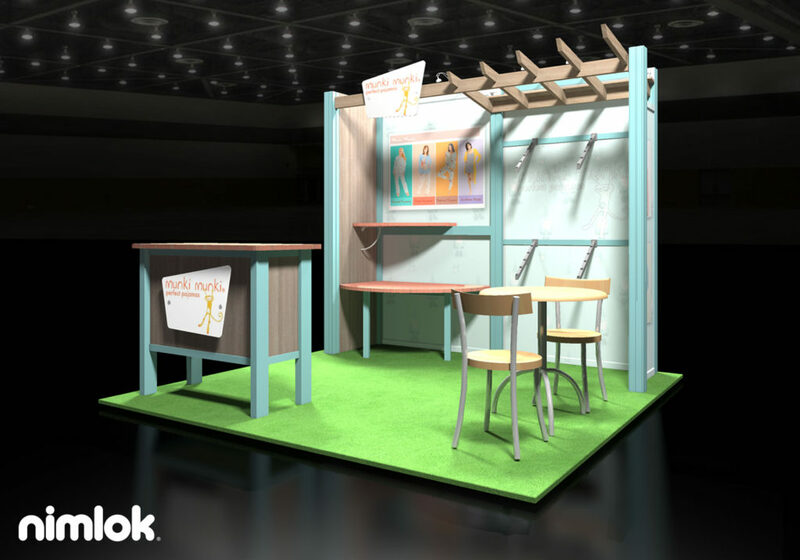 For more tips on designing your next trade show display, download Nimlok’s Exhibit Design Guide. Learn how to complete an exhibit design needs assessment, design your trade show graphics and more with this free comprehensive guide.